The upcoming Homecoming Weekend, Oct. 7-9, will be full of events for students, parents, grandparents and alumni alike. It will include many traditional activities, along with new opportunities for participants. The weekend will kick off on Friday with convocation in the church-chapel. During this time, various alumni will be receiving awards for outstanding displays of GC’s core values through their professions. Receiving “Culture for Service” awards are Ellah Wakatama Allfrey, ’88 and Doug Swartzendruber, ’78. Allfrey will be recognized for her contribution to the publishing industry and will be the speaker for the convocation. Swartzendruber will be acknowledged for his work in the field of medicine. The “Champions of Character” awards will be going to former GC athletes Aletha Stahl, ’89 and James Gingerich, ’66. Stahl, a former GC cross country stand-out, is now a French professor at Earlham College. Gingerich, a former basketball and baseball player at GC, has worked in the agricultural economic development industry for 34 years. Both recipients will speak at an awards ceremony on Saturday at the Rec-Fitness Center. Gingerich, along with seven other alumni, will also be speaking at a two-day symposium put on by the biology department. The first of these events will be a public forum on sustainable agriculture on Friday in room 28 of the Administration Building. On Saturday, alumni will be featured in a panel discussion in Newcomer Center room 17. All alumni at these events have worked or are currently working in the field of sustainable agriculture and the focus of their dialogue will be on the accessibility of quality food in a global context. A new addition to this year’s Homecoming Weekend is the incorporation of Grandparents’ Day into the regularly scheduled celebrations. Most of the events organized for the grandparents of students will be happening on Friday, including a breakfast with President Brenneman at the church-chapel and opportunities to attend certain classes and lectures. Another big attraction of the weekend will be the annual Peace Play taking place on Friday, Saturday and Sunday in the Umble Center. This year, the theater department will be putting on “Party Favors,” a political drama by Cary Pepper. This is one of the few events with an admission price, which is $5. From the art department, there will be a rededication of the sculpture by John Mishler ‘72, Broken Shield, which was recently refurbished. Merrill Kraybill, ’79 will be presenting his exhibition “Between Earth and Sky” at the Music Center’s Hershberger Art Gallery. Various other options for those attending Homecoming on Saturday will include class reunions, an alumnus versus student Ultimate Frisbee match and a hymn sing. There will also be the chance to watch GC’s volleyball and women’s soccer teams in action. As way of ending all events on Saturday, the music department will be presenting the annual Homecoming Music Gala. Performances will feature the college choirs and orchestra in Sauder Concert Hall. 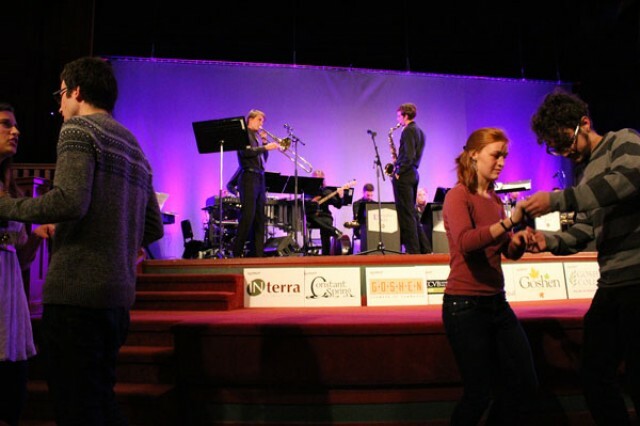 The wide variety of events for Homecoming is part of Goshen College’s attempt to ensure that the weekend is accessible and open to all beyond just alumni and students.